There are 14 posts filed in Equipment and Gadgets ( this is page 2 of 2). So today I am reviewing the SKLZ Accelerator Pro ball return putting mat/ green. I have had this product about a year now and feel that I can give some good feedback on this item. 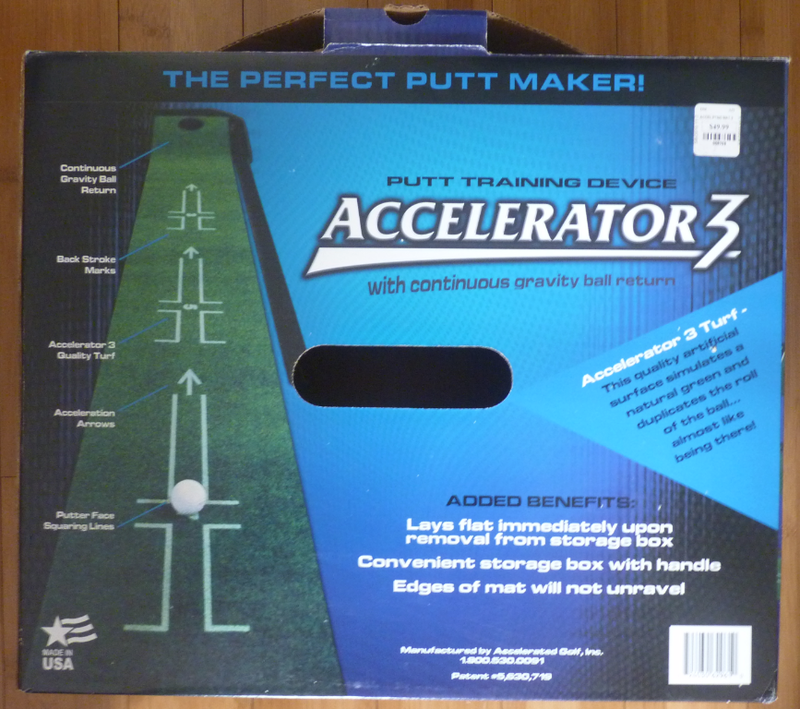 At the time I was looking to improve my putting and wanted to find a mat which I could use at home. I looked at several different options and found that many were simply too short or were gimmicky – i.e. had areas for water etc. 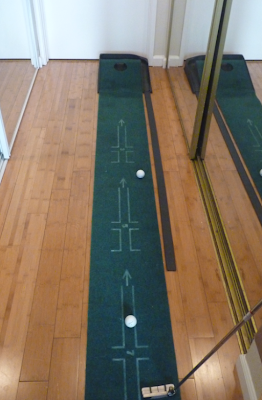 This detracted from the my main purpose – to find an indoor putting green which would help me improve my putting stroke. As this is blog is focused on golf in the Los Angeles area, I should also note that SKLZ who make this product are a local based company and based in Southern California. This putting mat is 9ft long and has an uphill gradient (19 degree slope). 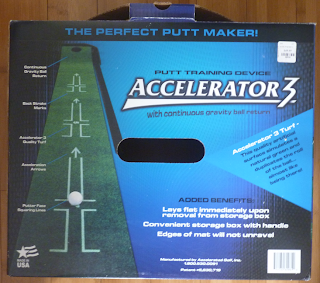 This is designed to make sure you hit the ball firm and train the golfer to hit 18″ past the hole; thus ensuring you do not leave your putt’s short. With the gradient aspect, it allows the ball to roll back to you by gravity along a simple strip of plastic. I found that this works adequately. Sometimes a ball will get stuck in the hole, but once you hit a second or third it frees them all up and the roll back. One claim though I must disagree with. It says on the box, “lays flat immediately upon removal of the box”. I found that this is not the case and if it has been stored away in the box, I have to leave it overnight with books on to make it flat once again. The key feature for me of this mat are the marked alignment guides. These are at 3 foot, 5 foot and 7 foot. These guides train you to bring the putter not only back the right distance for the specific putt, but also straight. It is obviously important that the face of your putter is straight to the target when hitting through the ball. A lot of people practice the long game out on the range, but do not practice putting so much (if at all). These 3, 5 and 7 foot putts are important to your game – 60-65% of shots on a typical round are within 100 yards of the hole. Improving your putting stroke will have a direct impact on helping to lower your score. I think the quality of the product is good for the price. It is made of plastic and note; this costs less than $50, so don’t expect high-quality construction. Despite that it has held up well thus far. My only grip is that it attracts a lot of pet hair, but I guess that is true with anything you put on the floor. I just simply vacuum it. The product folds down and goes away into the box relatively easily. I recently moved to somewhere with hardwood floors and it works great. Previously I used it on carpet and it also worked well. The mat has a Stimpmeter rating of 10 on a firm rug and 11 on linoleum surface. According to the manufacturer it is made from a true-roll-turf and the edges will not unravel. From what I have seen, I would say that this is accurate. It is important when putting to have a good routine and a consistent stroke. I ensure I go through my same on-course routine when I use this training aid, in order to get it ingrained into my brain. I happen to have my mat positioned in a corridor with a mirrored closet door in front of me. This is good as I can check on my posture and position of the ball as I take each putt. I really feel that this product has helped with my putting stroke and in particular alignment. If you just spend a few minutes each day, you will notice the difference out on the course. In addition I consider the SKLZ Accelerator Pro Ball Return Putting Mat reasonably priced (~$40) compared to some of the other products out there. I will start by saying that I was not paid to endorse/ review these clubs. I came across them while reading a magazine a few months back and thought they looked cool. So I thought I’d share them on my blog for others to see. 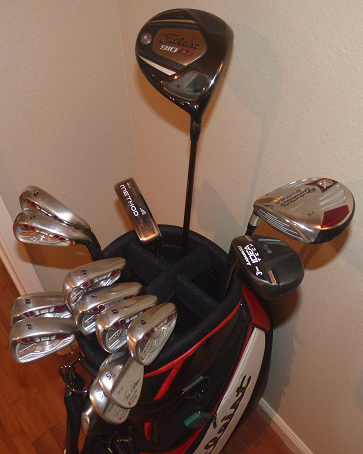 When I first saw these clubs I immediately showed them to my significant other. She was thinking about getting into the game and I knew she would like the “bling” on them. I think they are very well designed and certainly aesthetically appealing. We have not personally tried them, as they only come in right handed and not left handed versions. I inquired and was told there are no left handed version being released anytime soon – big negative for us! From the reviews I have read, they seem pretty positive. With people saying they are easy to hit. They are reasonably priced and can be fully customized. So you can select different length/ type of shaft, grips etc. The iBella Obsession women golf clubs are exclusively designed for women golfers and not just a man’s model painted an alternative color. What’s the difference between men’s or womens golf clubs? Women golfers have quite different needs and the clubs require a unique set of specifications to complement their swing style. Whether golf club driver, fairway woods, ladies golf club hybrids or golf irons, specific design elements were carefully implemented to meet the demand for the best womens golf clubs. Each iBella Obsession ladies golf club appears with a with a hot pink, white and silver color scheme and accented with a butterfly motif and authentic Swarovski crystals. The iBella Obsessions not only make the best beginner golf clubs for women but are the best ladies golf clubs for intermediate players too. 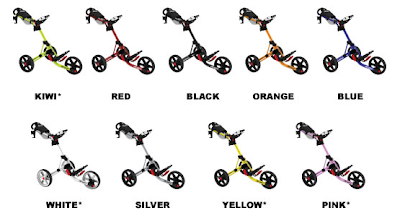 The line is available in both custom assembled pink ladies golf clubs or ladies golf club components. Carrying a bag of clubs on a hot summer’s day can sometimes be hard work. I often found my pockets and hands full, with a drink in one hand and a scorecard in another. Then every shot having to put everything down. I decided to look into carts. I came across Clicgear. After looking at numerous reviews I picked up one of these about 9 months ago. I love this cart! The cart is light weight and folds up really small. Once you get the hang of it, you can set-up the cart in 10 seconds. 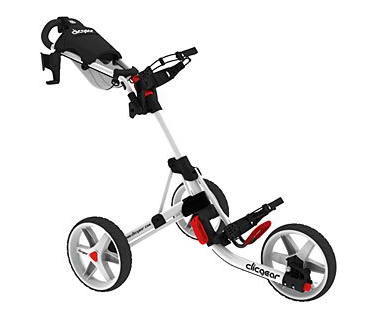 With the three wheels it is really sturdy and I have never had any stability issues while using it. There are two features which I really like – the cup holder and the center console with the scorecard holder. I can store my car keys, cell phone etc safely and free up my hands and pockets. This cart just makes the whole process of playing easier. I can focus on my shots and club selection and not worry about hauling everything around. 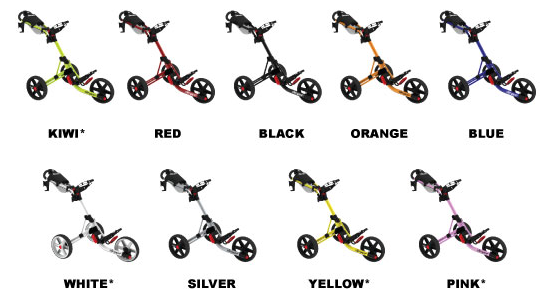 The carts come in a bunch of different color options. I personally went with the white. There are a bunch of accessories available on their website. I purchased the wheel cover. It is of relatively thin material but despite that it is holding up with no rips or damage. It was just $15 and prevents all of the loose grass on the wheels getting in the truck of the car. Another accessory which I may look at in the future is the Clicgear seat. It is aluminum and attaches onto the frame of the cart – with a max weight of 220 lbs. This may be useful to rest my weary legs on those busy courses with slow play. 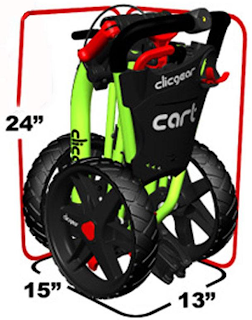 These Clicgear carts are quite expensive, at the time of this review they are $199 on Amazon. I actually got mine from the manufacturer direct. I ordered a refurbished one, which arrived like it was brand new. I received a good discount for getting a refurbished model. Although spending $200 on a cart may seem like a lot, I consider it a great investment. The cart is really well built. I expect it to last me a long time. I have learned from previous experiences and strongly believe it is best to buy good once, rather than junk which will only last a few months. Also if you rent carts, the money each time adds up. At the time of this post there are 101 reviews on Amazon. 99 of those 101 are 4 or 5 stars. If you are in the market for a push cart, I highly recommend this product. Also walking with a push cart (as apposed to an electric golf cart) is great exercise and really good for you. Over the past couple of years I have switched out my clubs several times, but finally have a combination I enjoy playing with. I will echo what all professionals say and advise anyone buying new clubs to get fitted. If you go by a local golf store, like Roger Dunn you can typically get fitted for free. The fitting usually comprises of hitting a few balls on an inside range. They can then tell your swing speed and other dynamics through the computers and sensors affixed to the range. Just because you get fitted at the store does not mean that you are obliged to purchase the clubs from that store. I purchased almost all of my clubs on eBay. I have found not only a tremendous selection, but also great prices; often ½ off store prices. I also know co-workers who have picked up clubs at thrift stores and Craigslist. The most noticeable purchase was Callaway RAZR irons (brand new) for $3 each. 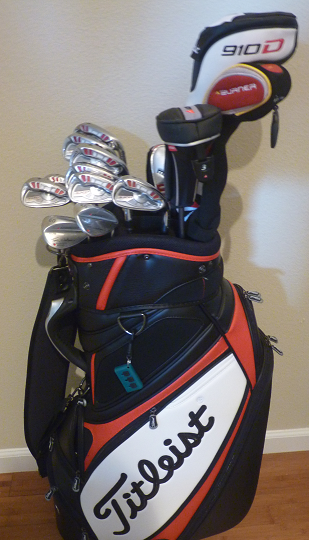 I am really happy with these clubs. The only change I may make in the near future is to replace my 56 and 60 wedges with Titleist Vokey’s. My bag is a Titleist midsize staff bag. I love it and it is the perfect size – not too big. I have recently just transferred from using TaylorMade balls to Bridgestone e6. I selected the e6 as I discovered I have a pretty slow swing speed and these balls are best suited to that. In addition to upcoming course reviews I will post periodically about various golf gadgets and equipment which I use. During a random visit to Roger Dunn I noticed the Ping G25 irons. I liked the color and look. In the subsequent days following I did some research and found amazing reviews for the clubs. I went to the store and tried some out. They felt fantastic and according to the launch monitor each club was going about 20 yards longer than my TaylorMade Burners. I got custom fitted and found a great deal online. Long story short now they are in my bag. Ping produces a quality product and customize for free. When I was a teenager I remember admiring Ping clubs at the local golf store. Now I guess I have fulfilled a childhood dream. I also upgraded my Adams wedges to a single Scratch Golf 56* wedge. I found previously with having a 56* and 60* it gave me too many options. For know I am sticking with one wedge to use around the green and will work on mastering different shots with that. Then further down the road, I will eventually get a lob wedge.